In France, any grape variety intended for use in producing and marketing wine must meet two cumulative conditions: be registered in the official listing and be classified as a wine-grape vine variety. Although the very first definitive classifications for resistant grape varieties were awarded at the beginning of 2017, some grape varieties have a temporary classification, even if they are sometimes registered in the official listing in the country in which they were bred. Limited areas of trial plots can then be planted. The modalities are defined by the Ministerial Order of 9 May 2016 under the new planting licensing regime. Temporary classification, definitive classification, registration in the EU common catalogue of plant varieties - what is the difference? Registration in the EU common catalogue of plant varieties: This relates to the allocation of a licence to market the vines and young vines of a variety in EU territory. The goal is to ensure that the vines and young vines marketed are healthy, loyal and marketable to protect the end-users (wine growers) against any fraud. The registration is based on two criteria. Firstly, the variety must meet the DHS criteria (Distinction, Homogeneity, Stability) that is a mechanism for characterising the new features brought by a new variety and a traceability mechanism used subsequently when certifying vines and young vines. Secondly, the VATE (agronomic, technological and environmental value) aims to ensure that the new variety has characteristics that are compatible with its intended use. The registration is European. A variety registered in France has access to the EU market and a variety registered in the EU official listing has access to the French market. In France, the variety must be proposed in the “vine” section of the CTPS (Permanent Technical Committee for Plant Breeding). Registration is announced by Ministerial Order and the EU Commission is notified. Classification of a wine-grape vine variety: The classification lists the varieties for which a wine grower can obtain a planting licence with the intention of producing commercial wine. In other words, only classified varieties can be planted with a view to producing wine. The planting licensing regime is a way of applying the common organisation of the Vine market and is designed to control the production potential of different wine-producing production areas in France and the EU. The variety must have an agronomic, technological or environmental advantage (VATE trials or bibliographical data). It must belong to Vitis vinifera or come from a cross with another species of the Vitis genus. The decision is made by order of the Ministry of Agriculture after an opinion from the FranceAgriMer Specialist Wine-growing Sector Council and the “vine” section of the CTPS. Temporary classification: This is a derogatory regime to the so-called definitive classification that allows for varieties that have never been grown in the national territory (EU variety or newly bred-created varieties) to be cultivated and exploited to produce wine. These productions are experimental and intended to acquire references in the behaviour of these varieties in the national land types under production conditions. These references are required to prepare the definitive classification of the variety (see above). – Varieties already EU registered: the temporary classification gives the production areas a chance to test in their production conditions the potential of varieties cultivated in other EU States and their suitability for the land type. – New varieties: the temporary classification takes place at the same time as the varieties are assessed for their registration. The results of VATE assessments established for the registration will be used to prepare the definitive classification. INRA uses the opportunities offered by the temporary classification to acquire both agronomic and epidemiological references in its mildew- and oidium-resistant varieties. The temporary classification allows controlled deployment of varieties in all interested production areas. These trials are monitored under the OSCAR Observatory, by applying the same monitoring protocol, so that relevant, exploitable elements of comparison are available to respond to scientific questions about resistance durability. These trials can last for ten years maximum, or five years only if the DHS has not been validated and can be renewed if necessary (they cannot last more than fifteen years). It can be decided upon if the file put together for a definitive classification is insufficient and if it seems necessary to assess the variety on a wide scale. Refused definitive classification makes it mandatory, once the maximum trial period has expired, to destroy this trial. Find all the OSCAR monitored resistant grape varieties with temporary or definitive classification on our page Resistant grape varieties. What are the approaches for experimental planting? 2016 saw the entry into force of the planting licensing regime which superseded the planting rights regime, with two major changes: the separation of the registration procedures for the official listing and the classification – until then, varieties registered in the French official listing were classified automatically – and the creation of the temporary classification (see above). Temporary classification offers the possibility of setting up trials for newly-created varieties (for example, the INRA varieties) or varieties registered in the official listings of other EU Member States. The files must be submitted to FranceAgriMer between 1 January and 31 March or between 1 August and 30 September. The cost is about €400 including VAT (decision DG FAM INTV-CONTNORM-2016-19). – All planting must be declared to the wine-growing department of the DGDDI (Directorate General of Customs and Indirect Taxation). The experimental nature of the vine is indicated in the nature of the vine (EX mention). – The maximum size for a trial plot is set at 1 hectare for a same variety. – The trial areas have a fixed quota of 20 hectare per variety per production area (three hectares nationally for new hybrids with no DHS as yet). The production area councils can state the trial monitoring modalities and on the relevance of the trials when other tests are conducted elsewhere on the same variety. – The duration of the trial is limited to fifteen years (see above). Thus, when there is no definitive classification at the end of fifteen years, the plot has to be grubbed up. – The wine produced on these plots is marketed without geographical indication and must not state the name of the grape variety. – The trial must be monitored by a competed body. It is stated (Order establishing the classification modalities for wine-grape vine varieties, version of 10 December 2015 and final version of 9 May 2016) that the body must have available a technical manager “with proven training in trials to Masters 2 level minimum”. The trial reports are supplied to FranceAgriMer and made public. Since 1 January 2016, the planting of vines is subject to the planting licensing regime, but the planting or replanting of surfaces intended for the trials can be exempt (Delegated Regulation (EU) 2015/560, decision DG FAM INTV-CONTNORM-2016-20). How to find planting material ? Distinction must be made between several scenarios: Varieties already registered in the European official catalogue: for these varieties, the vines and young vines can be marketed in France. Where the variety is classified definitively, these varieties can be planted. The planting material is accessible from EU or French nurserymen who have committed to production under the implementation of the certification scheme. Some resistant grape varieties are also already relatively well distributed – for example, the Regent covers more than two thousand hectares in Germany – and the quantity of available material is not always an obstacle. INRA Bouquet varieties: these varieties are currently accessible for trials under temporary classification. A request to carry out trials must be submitted to INRA (cailliatte@inra.fr) or IFV (bloy@vignevin.com). The material provided at this stage is standard material from tested, virosis-free plots. The quantity of available material can, nevertheless, be limited and will increase as the campaigns progress. Can AOC (protected designation of origin) be made with these new grape varieties? For the moment, the answer is clearly no. 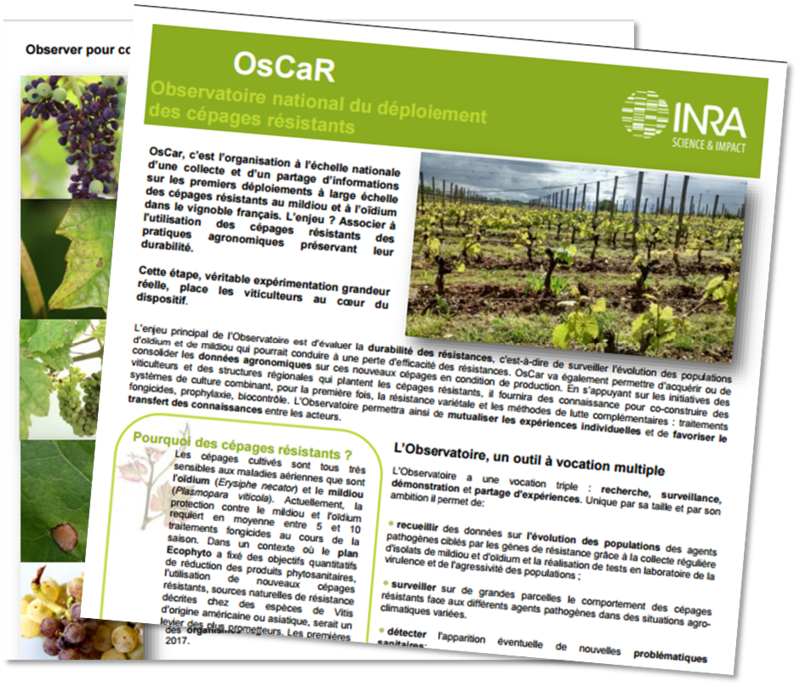 In normal circumstances, for a grape variety to be registered in the specifications for an AOC (the equivalent of PDO in France), a file to alter the specifications must be submitted to INAO (The National Institute of origin and quality in France), apart from its classification and registration in the official catalogue. Every major alteration to the specifications must be preceded by studies and trials. The grape variety in question must be tested for ten or so years in the AOC area so that it can potentially be included in the specifications as an accessory grape variety, with no more than 10% share in the blends. Any new introduction can only take place if its maintains or reaffirms the typical features of the AOC and its link to the land. There is, however, a legislative obstacle to the arrival of resistant grape varieties in PDO: European regulations prohibit the taking into account of varieties from interspecific crosses (Regulation (EU) 1308/2013), which is the case of resistant grape varieties (bred by crossing Vitis vinifera with other species)! Note that this does not apply to the PGI which can introduce grape varieties from interspecific crosses in the specifications.